Please just help me solve my query. My aspiration is to score more than 700 and wanted to peruse executive mba from iims. Please suggest and guide me whether I need more rigorous practice and study. The official practice tests are the most accurate practice tests out there, but you should take a few more of those tests. One data point is probably not enough. Official tests are most relaiable, but not 1 and 2. Try 3-6 tests, based on these scores you can book the slot. Yes I guess it work. I have also planned to take a few more. I am getting stuck in verbal.i am not able to stretch beyond v35 to a maximum limit. Can anybody suggest approximately how many questions should be correct to get v40.. Although I know it depends on scoring adadaptability but on an average how many questions should be correct to get a v40.. The scoring algorithm on the Official GMAT is far more complicated than most people realize. Since that algorithm is proprietary, no GMAT company has an exact match for it, thus CAT scores can vary a bit based on the 'biases' involved in their respective designs. The most realistic CATs available are the 6 from GMAC, but the CATs from Kaplan, MGMAT and Veritas are all 'close enough' to the real thing that they will provide you with a relatively realistic score assessment (assuming that you correctly take the CAT in a realistic fashion). 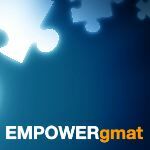 At higher-and-higher score levels, the GMAT becomes really 'sensitive' to little mistakes (especially on 'gettable' questions). Thus, you also have to be detailed about how you performed on each of these CATs. How many questions did you get wrong because of silly/little mistakes? If you're missing out on too many gettable points, then the accuracy of the CAT isn't the issue - the work that you did (or didn't do) during that CAT is what you have to be concerned with. In case of logic, I can say that the 3rd party's algorithm is more trusted than GMAC, but at the end of the day you're going to take GMAC's test not the 3rd party's test at all, remember. So, stick on GMAC's test. Try to take 2 or 3 more mocks with GMAC's testprep. Your GMATPrep's score reflects more than 3rd party's mock test in the real GMAT. Guys please help me evaluate my profile. I have scored 89% in 10th and 83% in 12th. I have done my civil engineering in 2013 and was placed in Sobha developers where I worked for 1 year. Then I joined Ambuja cements and worked for 50 months. In Ambuja I did pretty well and had gathered 23 awards in total for best performance in various categories. Then I joined Hilti India as technical account manager but unfortunately things didn’t go well and I left the organization after 4 months. Please suggest guys which will be more suitable to join?? Hoping to get guidance from you all guys. Ask to Ask Admissions Consultants, please. From your prior message, I assume that you have not taken the Official GMAT yet, so the various Admissions Experts probably will not be able to fully analyze your profile (since the GMAT is such an important part of the application).